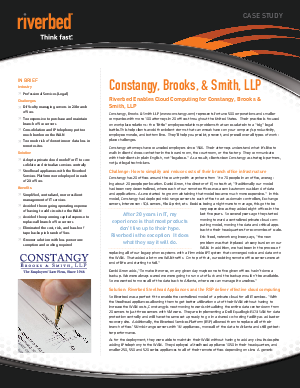 Constangy, Brooks & Smith is a labor and employment law firm that operates 21 offices across the United States. Because each office housed its own decentralized network equipment, it was not only difficult for the firm's small Atlanta-based IT team to manage the organization's infrastructure effectively, but attorneys also had limited access to shared client information. To consolidate and optimize its network, Constangy selected Riverbed solutions to migrate to virtualized servers running on Steelhead appliances and eliminate unneeded equipment. Download the case study to learn how your organization can also improve network performance and lower costs.